South Africa' may well refer to the Boer War. Reynolds and Branson was a company in Leeds, UK, apparently founded in 1816. The company had premises in central Leeds, at 14 Commercial Street and 13 Briggate. The firm was apparently founded by Thomas Harvey. Subsequent company names include Harvey & Reynolds (1856), Harvey, Reynolds & Fowler (1861), Haw & Reynolds (1864), Haw, Reynolds & Co. (1867) and Reynolds & Branson (1886), mostly recorded at addresses in Commercial Street and Briggate. Harvey, Reynolds & Company was also at the same addresses in 1881 by this date, Harvey (if the same man) would have been very old or dead, and it is possible this was a trading name used by the surviving company owners. The company is generally described as a chemist and optician, but also made general medical equipment (including microscopes and mercury thermometers) and photographic items, including cameras and magic lanterns. 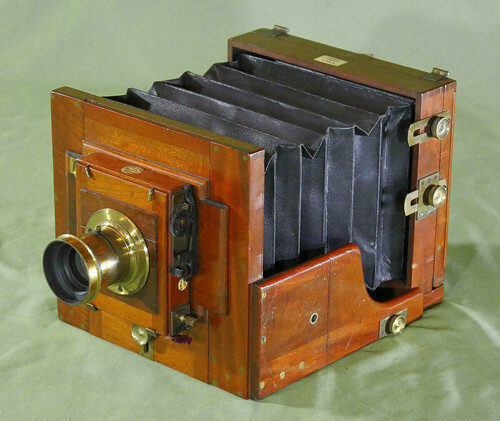 Whole- or half-plate field camera, about 1890. 'Phoenix' shutter: a rather crude shutter, with a hinged flap as the opening blind for each lens, that automatically releases a dropping plate as the closing blind (the 'drop' is accelerated by a tensioned rubber band). The Phoenix was made in both normal mono and stereo models Reynolds & Branson patented the Phoenix in 1883, and Branson patented a further development of the shutter on his own. ↑ 1.0 1.1 McKeown, James M. and Joan C. McKeown's Price Guide to Antique and Classic Cameras, 12th Edition, 2005-2006. USA, Centennial Photo Service, 2004. ISBN 0-931838-40-1 (hardcover). ISBN 0-931838-41-X (softcover). p819. ↑ Grace's Guide; the entry includes an advertisement for three items: patient record cards, filing drawers for them, and suppositaries! ↑ 3.0 3.1 Bennion, Elisabeth (1979) Antique Medical Instruments, Sotheby Parke Bernet Publications/University of California Press, London, 1979, p319. at Google Books. ↑ 1881 advertisement for Harvey, Reynolds & Co.'s Phosphorade, at Mickey Mike's Leeds Ginger Beer & Mineral Water Bottles (including ginger beer and mineral water bottles and pot lids by Reynolds & Branson). ↑ Microscope by Harvey, Reynolds & Co., sold at auction by Red Baron Antiques, Altanta, GA in January 2013. ↑ The Allbutt Clinical Thermometer (archived), made by Harvey, Reynolds & Co., at the blog of the University of Leeds' Museum of the History of Science, Technology and Medicine. 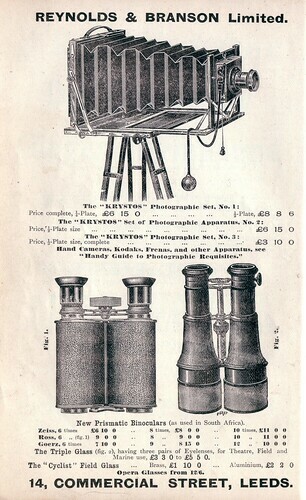 ↑ British Journal of Photography Vol XXI (1874), No. 733, p247, 'The Harrogate Rest', describing a portrait photographer's head-rest introduced by Harvey, Reynolds & Co.; at the Internet Archive. ↑ Stereo Phoenix shutter at Early Photography. ↑ Mono Phoenix shutter in the catalogue of an exhibition Cameras: the Technology of Photographic Imaging at Museum of the History of Science, Oxford 20 May - 13 September 1997. British Patent 16373 of 1893 granted to F.W. Branson, Improvements in or in connection with cameras, describing (i) the use of ribs to strengthen and stiffen the sliding parts of a focusing bed, and (ii) a design for a rack-and-pinion focusing mechanism using racks with teeth cut at an angle and pinions cut in a spiral, to give smoother focusing operation than a conventional rack and pinion; at Espacenet, the patent search facility of the European Patent Office. Photograph of a photographic exhibition of 1891 in the Leeds City Art Gallery, with a display case of goods by Reynolds and Branson, presumably sponsors of the exhibition; at Leodis - a photographic archive of Leeds. Another display case, facing this one, showed goods by Pearson and Denham.